Just outside of Princetown there is what looks like a small circular enclosure, this is Fice’s Well. If legend is to be believed it has stood here for 437 years and the spring was the source of salvation for John Fitz. One day he and his wife were riding on the moor when the piskies conjured up a thick, impenetrable mist which completely disorientated the couple. For hours they rode round and around in circles unable to get off the moor. The only thing they could find was a small brook which was not a lot of help but they decided to follow it. Eventually it led them top a small spring bubbling up out of the peat. By this time both the couple and their horses had become tired and thirsty so it was decided to take advantage of the cool waters and slake their thirsts. No sooner had the water passed their lips than the mist cleared to reveal that they were in fact very close to Rundlestone and the Princetown road. It was then that the couple realised that they had been ‘piskie led’ by the little folk of the moor. In gratitude John Fitz erected a stone shelter over the spring so that other travellers could easily find it and imbibe of its waters. Because this was a faerie well and the water had the magical powers of being able to break the piskies spell it soon became a popular spot for those wishing to call on its healing powers. Inside is the stone covered spring and on the lintel stone is carved ‘I.F. 1568’. Ironically Faull also relates the story of how in the 19th century, Sabine Baring-Gould visited the well with a party that included some Ordnance Survey officers who had their equipment with them. It seems that a mist came down and the whole party got lost – or were they piskie led? The well is said to have had curative powers against eye problems with records of one man that annually travelled a long distance to take of the well’s waters. Fice’s Well and enclosure wall. There is an identical story for another well in Okehampton Park and this is where the two stories intertwine – see Fitz’s Well. 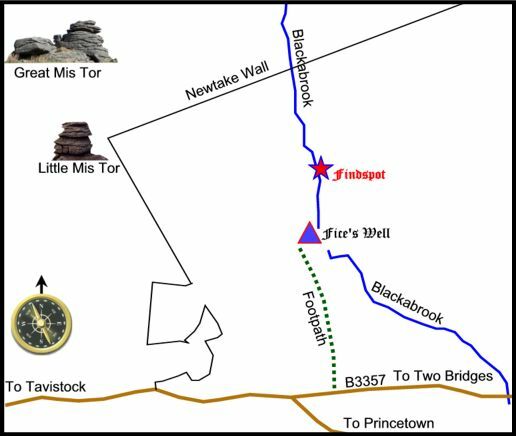 In 1906 a convict from Dartmoor Prison was working on a road for the prison farm just above Fice’s Well when in the peat he made two interesting discoveries. The first find was quantities of oak boles and roots thus suggesting that at one time oak trees were growing along the Blackabrook. The second discovery was a bronze rapier. The blade was 18″ long, it had been detached from its hilt but still had the fixing holes. It was found lying flat under about 18″ of peat. It is possible that it was dropped after the wood clearance but before the peat started to form. Stone moulds for making the rapiers have been found in the Teign Valley and are characteristic weapons of the mid Bronze Age period, this would date the weapon to the period 1200 – 900BC. There are no associated graves or settlements and was unlikely to have been deliberately buried. Petit, 1974, p.163. The rapier has a National Monuments Record number of NMR_NATINV-439650 and according to Fox, 1973, p.115, is one of only ten that have thus far been found in Devon. Plan of the Fice’s Well area. As can be seen from the above plan, the actual findspot of the rapier was just under 400 yards from the well. One mile to the East are a group of Bronze Age settlements, One and a half miles to the South-West is the Bronze Age ceremonial complex of Merrivale and about a mile and a quarter to the South-South-West is another group of Bronze age settlements. It therefore seems, without further archaeological investigation, a bit misleading for Petit to state that there are no associated “graves or settlements” with the rapier. It would be nice to know for how long this source of water has been used because if it dates back to the time of the rapier could it have been a votive offering of some kind? Granted many of such offerings were ‘decommissioned’ by either breaking or bending, this was thought to take the object out of the human world. Or was it to ensure nobody else could use it? Anyway, this one look intact but even it’s worth a thought. Fox, E. 1973, South West England 3,500 BC – AD600, David & Charles, Newton Abbot. Hemery, E. 1983, High Dartmoor, Hale Ltd, London. Petit, P. 1974, Prehistoric Dartmoor, David & Charles, Newton Abbot. I wonder what happened to the bronze rapier?